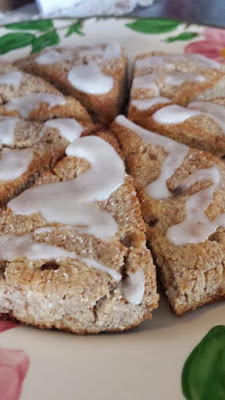 Cinnamon Scones three times fast? I know that doesn't really shock you now does it? what is causing your tummy issues. to stick to a low carb diet. 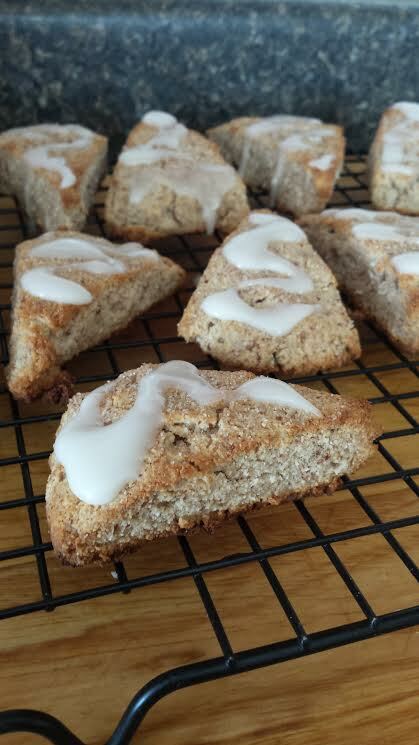 almond meal and coconut flour scones. and tweaked it to where it does not have any wheat flour. baking soda, cinnamon and salt. combine the sliced butter until it forms into pea sized crumbs. the egg and the almond or vanilla extract. no more than 1/2 inch thick. Cut each circle of dough into 8 slices. Place on an un-greased cookie sheet. Lightly sprinkle with sugar if desired. or until they are lightly brown. Drizzle with an almond frosting if desired. I was quite amazed at the flavor and texture of the scone. try these and let me know how you liked them! Thank you for sharing this amazing Scone recipe Amy! These look awesome, Amy. I also use almond and coconut flours but have never heard of green banana flour! I am not the baker that you are but am always looking for great ways to cut the carbs. I have been having fun using alternative ingredients for waffles! I have a few more that I am going to try and then hope to share them on my blog. Thanks for the inspiration! I tend to like things made with almond flour. I've never made scones. I am here today via Roxy's page wherein your comment caught my attention. Happy to meet yet another believer woman in Christ. Thanks for sharing this sweet recipe. Will surely try this out. HI! It's wonderful how you create such goodies in your kitchen! Oh if only I could eat nuts! I'm glad you are finding gluten free foods you enjoy! Praying you have a delightful day! They look delicious and served with a nice cup of coffee or tea... Heaven! Good morning, my friend! Long time no chat....how are you? I hope all is well with your and your precious family. Your recipe looks wonderful and it's one I will have to remember to make sometime for my sister since she cannot have any wheat. Thank you for sharing!